Delhi's air quality was recorded in 'very poor' category on Tuesday as winds continued to blow from regions with rampant stubble burning and pollution watchdog CPCB recommended a ban on entry of trucks into the city between November 8-10. Twenty-five areas in Delhi recorded 'very poor' quality air, while eight areas recorded 'poor' air quality. Experts have warned of a spike in the pollution levels after Diwali even if "partially toxic crackers" are burnt compared to last year. Delhi Environment Minister Imran Hussain appealed to people to help in reducing local sources of pollution by celebrating a cracker-free Diwali on Wednesday. "I would like to take this occasion to share with the residents of the national capital, the existing ambient air quality position and would like to request the residents to persuade their near and dear ones for desisting from bursting fire crackers and convince their children about the importance of a green and clean Diwali," he said. He also noted that the contribution from the burning of agricultural waste in the recent past has gone up to 60 per cent. "There was a significant intrusion of stubble generated pollution on Monday, which has shown a declining trend on Tuesday, as we approach Diwali," Hussain said. Citizens gathered outside the Environment Ministry to protest against the alarming rise in the pollution level that has raised health concerns. The protesters submitted a letter to a senior officials of the Union Environment Ministry and the Delhi government, demanding their "Right to Breath" and faster implementation of a time-bound National Clean Air Program. To address the air pollution situation, the Central Pollution Control Board (CPCB) said it was mulling inducing artificial rain over the city after Diwali to wash away hazardous pollutants plaguing the national capital. A CPCB official said they are waiting for meteorological conditions to become stable and would then use cloud seeding for inducing artificial rain. Cloud seeding is the process of combining different kinds of chemical agents - including silver iodide, dry ice and even common table salt - with existing clouds in an effort to thicken the clouds and increase the chance of rain or snowfall. The pollution monitoring body is in talks with the Indian Institute of Technology, Kanpur, and the India Meteorological Department (IMD) for this. An IIT Kanpur professor said weather conditions were being monitored to become favourable for creating artificial rains. Delhi recorded its worst air quality of the season on Monday, when the pollution levels were eight times the permissable limit as a thick haze engulfed the city. Doctors have said the impact of air pollution on public health can be compared to smoking 15-20 cigarettes a day. The overall Air Quality Index (AQI) on Tuesday was recorded at 320, which falls in the 'very poor' category, according to data by the CPCB. It was a slight improvement over Monday's AQI of 434 which falls in the 'severe' category. Authorities attributed the pollution to a change in wind direction, which is now blowing from the stubble burning areas of Punjab and Haryana. 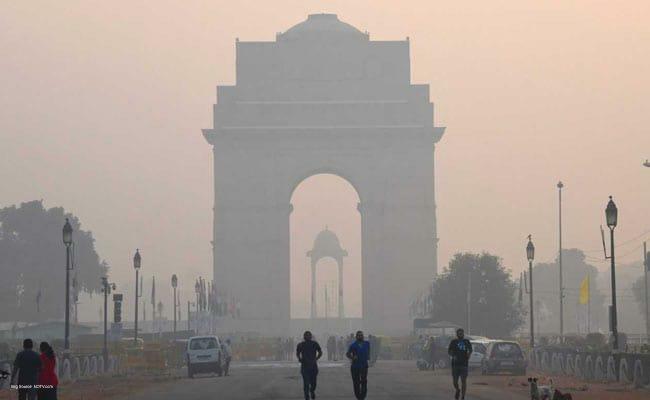 Delhi's air quality is expected to deteriorate to 'severe plus emergency' category after Diwali, the Centre-run System of Air Quality Forecasting and Research (SAFAR) said. The CPCB said it has recommended to authorities to ban the entry of heavy vehicles in Delhi after Diwali from November 8 to 10, when the air quality is expected to deteriorate further to 'severe' level. The recommendation was made in view of the heavy pollution caused by such vehicles. It might add to the woes of the national capital which is already battling alarming levels of pollution, a CPCB official said. Other recommendations included strict vigil to check waste dumping and burning, intensification of efforts by traffic police to deal with traffic congestion, continuation of measures recommended by the task force, like ban on construction activities and shutting down coal and biomass based industries. The CPCB also appealed to people to avoid the use of diesel private cars.